Here in sunny southern California, an outdoor living area such as a patio can add significant value and enjoyment to your home. However, this is only true if you keep your patio clean and attractive. A dirty, grimy, algae-coated patio is hardly inviting for private relaxation or for entertaining. We can also clean any concrete or stone benches, planters, or walls you may have around your patio. The Right Water Pressure & Temperature: With the right combination of pressure and flow, we can remove all kinds of surface dirt from your patio. We can also blast away unsightly mold, mildew, and algae. Our experienced technicians are always careful to tailor the water pressure and temperature we use to the needs of the material being cleaned, to avoid damaging softer pavers or stone. The Right Cleaning Agents: Depending on how soiled your patio is, hot water and pressure may be enough to get it clean. But if you have any oily or greasy stains, we will likely need to use a cleaning agent to help lift them. We only use the best-quality cleaning agents that are both effective and safe for the environment. The Right Sealer: By applying a sealer after patio cleaning, we can protect the surface against future dirt, grime, and stains. A sealed patio will also be easier to keep free of dust and dirt. We offer a variety of sealers to choose from depending on the material your patio is made of and your goals for its appearance and performance. Why Stop at the Patio? Before you call for patio cleaning, take a look around your property and see if there might be other areas that need cleaning. Bundling other services such as driveway cleaning, paver cleaning, roof cleaning, building washing, or rust removal together with your patio cleaning can help you save money. 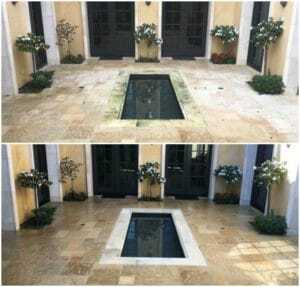 Call us at 949-514-7749 for a free quote on any and all pressure washing services you may require.